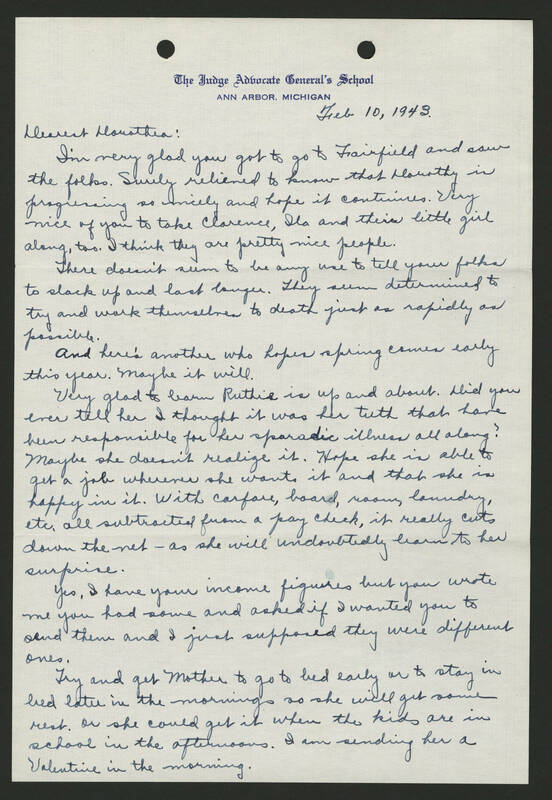 Feb 10, 1943 Dearest Dorothea: I'm very glad you got to go to Fairfield and saw the folks. Surely relieved to know that Dorothy is progressing so nicely and hope it continues. Very nice of you to take Clarence, Ida and their little girl along, too. I think they are pretty nice people. There doesn't seem to be any use to tell your folks to slack up and last longer. They seem determined to try and work themselves to death just as rapidly as possible. And here's another who hopes spring comes early this year. Maybe it will. Very glad to hear Ruthie is up and about. Did you ever tell her I thought it was her teeth that have been responsible for the sporadic illness all along? Maybe she doesn't realize it. Hope she is able to get a job wherever she wants it and that she is happy in it. With carfare, board, room, laundry, etc. all subtracted from a pay check, it really cuts down the net - as she will undoubtedly learn to her surprise. Yes, I have your income figures but you wrote me you had some and asked if I wanted you to send them and I just supposed they were different ones. Try and get Mother to go to bed early or to stay in bed later in the mornings so she will get some rest. Or she could get it when the kids are in school in the afternoons. I am sending her a Valentine in the morning.